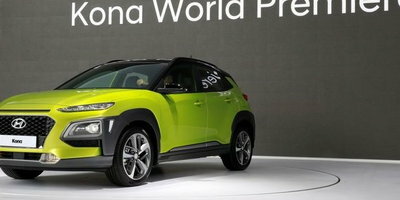 Revealed in June, 2017 with a production version released later that year, the Hyundai Kona crossover, named after the coffee-producing western district of Hawaii's big island, joins a plethora of competing models from nearly every manufacturer in the hot subcompact segment. It's also an all-new model for the brand in 2018, and Hyundai's smallest SUV to date. 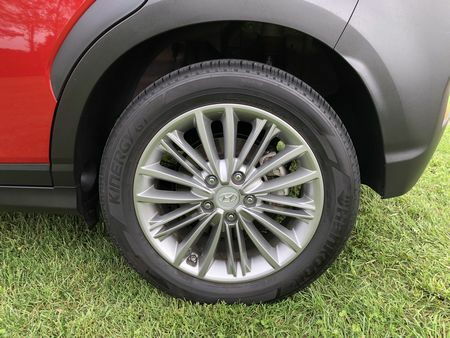 The Kona looks best when rendered in either gray or black, as both finishes tend to camouflage the excessively enthusiastic use of black cladding – especially around the wheel openings and the rear fascia. The styling cues up front suggest the current-gen Jeep Cherokee, pre face-lift - not necessarily a good thing – with a narrow band of LED daytime running lights resting atop the fenders, and the headlights sitting below, surrounded by cladding ("surrounded by cladding" is an oft-repeated theme here). The trapezoidal-shaped grille – the only nod to convention – is topped by a narrow faux upper air intake. 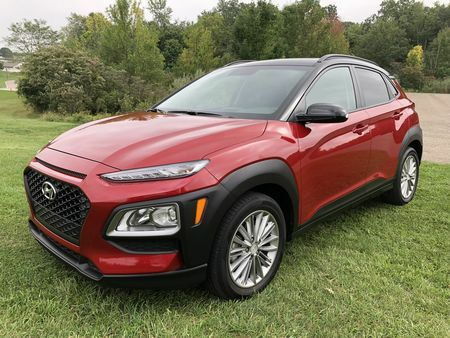 Starting with the headlight surrounds, black plastic cladding continues along the sides, bulking up around the wheel arches and tricking your eyes into thinking Hyundai's small crossover rides higher than it actually does. It all ends in a flourish at the rear fascia, surrounding pods that contain the backup lights and rear reflectors just behind the rear wheel wells in the design's most flagrant assault on the senses. 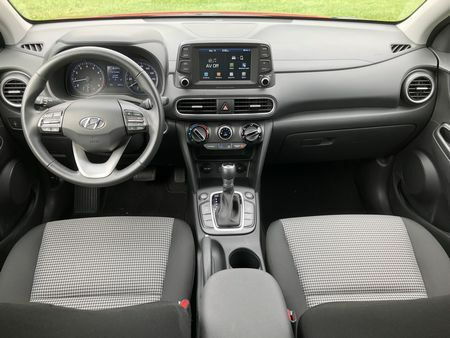 Fortunately, that excess is wrapped around a more conventional interior with high-quality materials, plastics with a slick-looking matte finish, various amounts of sound deadening (depending on trim level), and a logical layout of buttons and knobs. The various panels fit together nicely, and the center console features a soft armrest with a small storage bin. The front portion of the console is open, offering a small storage shelf, two power outlets, one USB port, and one AUX port. 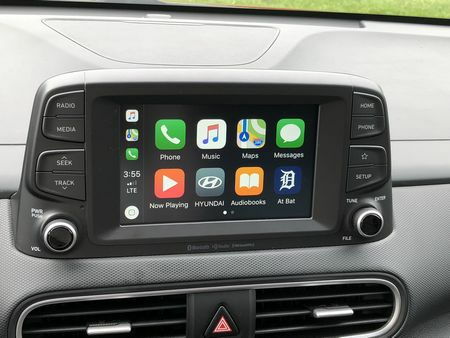 An eight-inch color touchscreen dominates the center dash, with redundant buttons on either side for the major functions - which makes setting station presets a snap - and an infotainment system that's Apple CarPlay compatible. 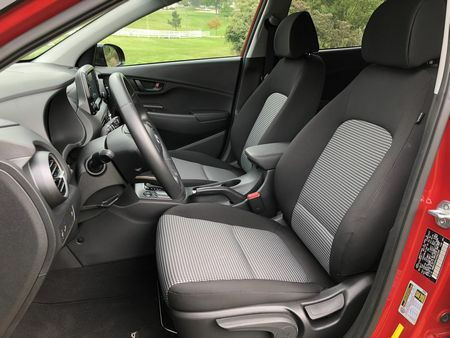 The cloth seats that appoint most trims are comfortable, with plenty of leg, hip, shoulder and headroom for two adults of practically any size up front. 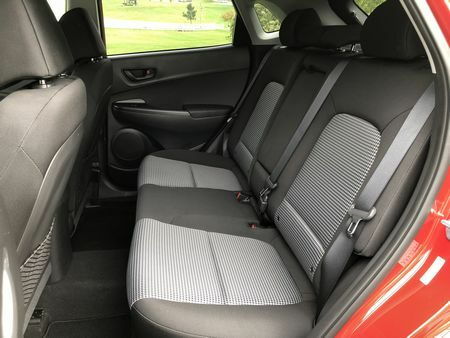 While the 19.2 cubic feet of cargo room behind the rear seats (expanding to 45.8 cubic feet when they're folded) is only average for the class, loading and unloading is aided by a low load floor and wide rear hatch opening. 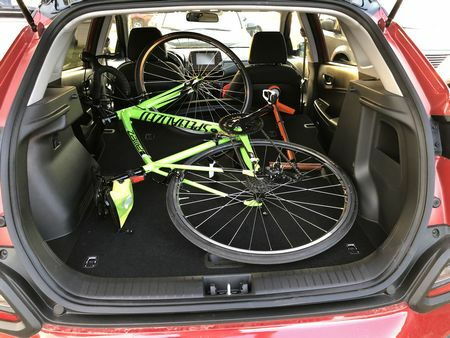 With both rear seats flipped forward, we were able to load a 52cm road bike without having to remove the front wheel – although the front wheel had to be angled upward in order to close the rear hatch. Looking at the other side of the ledger, the interior doesn't punch above its weight class even in top trims, while lower trims – sans a sunroof – feel dark and downright cave-like. And while the Kona can accommodate five adults, we wouldn't recommend it for longer trips as rear head room is sufficient, but leg room can be tight for those above average in height. The Kona features a pair of engine/transmission combinations, depending on trim level. 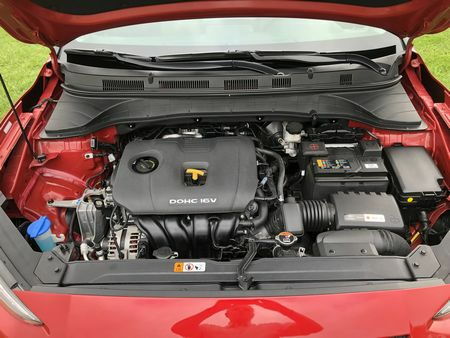 SE and SEL models receive a normally-aspirated, 147-horsepower, 2.0-liter four-cylinder mated to a six-speed automatic, while Limited and Ultimate versions are equipped with a 175-hp, 1.6-liter turbocharged four-cylinder. Fuel economy is decent for both engines, with an EPA-estimated 27 miles per gallon city, 33 mpg highway, and 30 combined for the 2.0-liter engine with front-wheel drive, and 25/30/27 mpg city/highway/combined for all-wheel-drive models. We observed a vehicle-measured 28.8 miles per gallon in our SEL tester in a mix of city and highway driving. At the same time, the 1.6-liter turbo scores an EPA-estimated 28/32/30 mpg with FWD and 26/29/27 mpg city/highway/combined with AWD. The 1.6-liter turbocharged four-cylinder found on trims like the Limited – in which we managed to grab a couple of hours of seat time - features quick off-the-line performance, with maximum torque available at a low and useful 1,500 rpm. Although hardly a back roads corner-carver, with either engine the Kona is much more fun to drive than many of its competitors. Both suspensions – MacPherson struts up front with FWD models featuring a torsion beam in back that's replaced with a multi-link setup on AWD modes with a definite nod to the latter - are calibrated for ride quality over handling, and do a nice job of absorbing both major and minor road imperfections. Corner induces body lean that's typical for a vehicle of this height and class, while the steering is nicely weighted, the brakes are easy to modulate, and there's a nice initial bite to the brake pads. But living in the Kona's world is far from perfect, as, like most small crossovers, a middling 6.7 inches of ground clearance won't inspire off-roading – not that the all-wheel-drive system is remotely up to the task. In addition, fuel economy in the more efficient turbo isn't markedly better than the base engine, while peak torque in the normally-aspirated 2.0-liter engine isn't realized until 4,500 rpm. 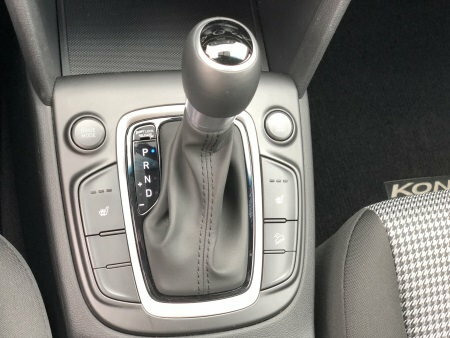 Most of our time was spent in an all-wheel-drive SEL equipped with the 2.0-liter engine, which we can attest offers leisurely off the line acceleration - although adequate - but also requires a bit of preparation before merging, and passing at freeway speeds. 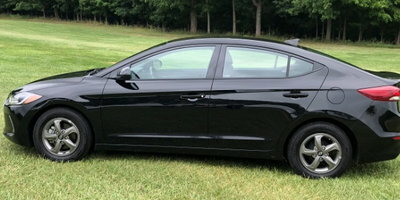 Finally, road noise – a characteristic shared by many vehicles in this class – is readily apparent, especially over rough and uneven road surfaces, while the seven-speed dual-clutch transmission gets a bit indecisive when shifting at low speeds and during acceleration – spoiling what otherwise should be the engine of choice. 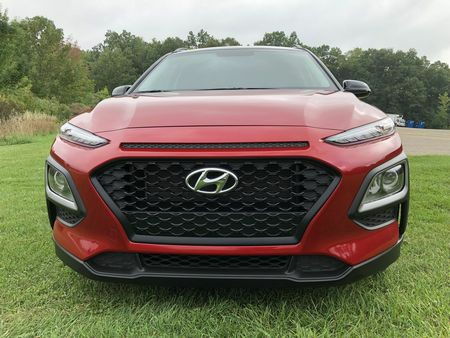 Pricing for the 2018 Hyundai Kona starts at $20,480 (including destination) for a front-wheel-drive SE and rises to $29,680 for an Ultimate model equipped with all-wheel drive. SEL and Limited trims fill the gap. 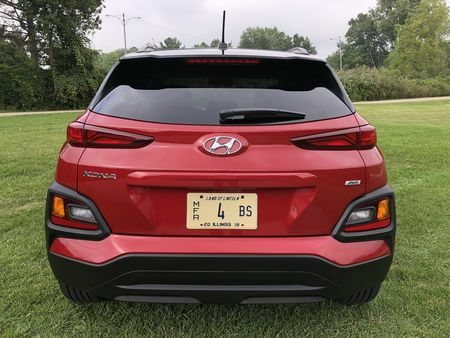 Hyundai's value proposition shows up on even the lowest trim and includes the usual power features plus 16-inch alloy wheels, LED projector headlights and daytime running lights, Bluetooth, Android Auto and Apple CarPlay, and a cargo cover. We'd look at one similar to our SEL tester. 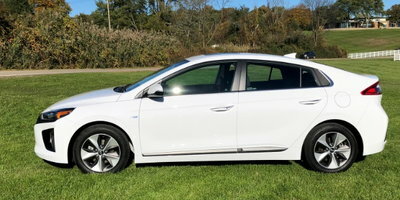 Opting for an SEL over the base version adds larger 17-inch wheels, a leather-wrapped steering wheel, heated front seats, a proximity key with push button start, satellite radio, heated outside mirrors with turn signals, rear cross-traffic alert, and blind-spot monitoring. We'd also opt for our tester's all-wheel drive ($1,300), as it comes with a smoother and more sophisticated multi-link rear suspension. Unlike the Kona we spent a week in, however, we'd add the $1,500 Tech Package with great features like a sunroof - that should go a long way in reducing the claustrophobic feeling we experienced due to the lack thereof - while also adding a sprinkling of active safety items. 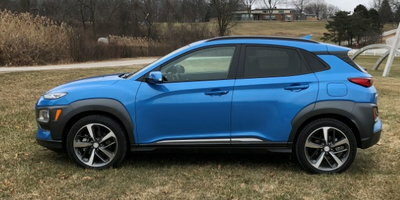 After living with one for a week and putting a few hundred miles on it, and despite a fussy design and wonky seven-speed dual-clutch transmission, we found that the 2018 Hyundai Kona meets the requirements of an entry-level crossover nicely. 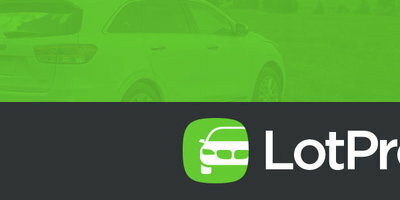 It's well priced, offers good fuel economy, a smooth ride, and enough features to stay competitive, and – most importantly to shoppers across the US of A – it's taller than a car. 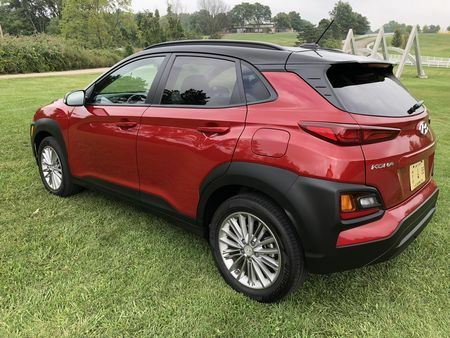 At the end of the day, the Kona is a bit better than a middle-of-the-pack offering that hopes to snag its share of the compact crossover pie with offbeat styling.